Nestled within Discovery Harbour, this 371 seat theatre is flanked by majestic Tall Ships and historic buildings. This unique venue is operated by award-winning Drayton Entertainment, one of Canada’s most successful professional theatre companies. Relax in the air conditioned comfort of this rustic theatre and enjoy a summer of light-hearted entertainment. Discovery Harbour’s on-location restaurant, Captain Roberts’ Table, is housed in a striking post-and-beam building near the historic site’s main entrance. 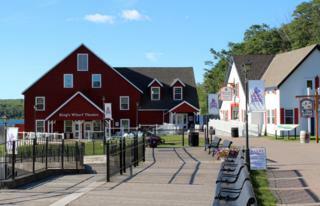 The restaurant is adjacent to Discovery Harbour’s waterside boardwalks, and offers a beautiful view of the historic Tall Ships and Penetanguishene Bay. Enjoy a light lunch or fine dinner, or just relax on the patio with a beverage. Captain Roberts’ Table is fully licensed. Huronia Historical Parks is pleased to announce a new operating partner for the beautiful Captain Roberts’ Table waterside restaurant at Discovery Harbour. Nick Boudouris is a well-known restaurateur in the local area, as the proprietor of the World Famous Dock Lunch at the Penetanguishene town dock, as well as being the current operating partner of Restaurant Sainte-Marie. Discovery Harbour recently completed renovations to the restaurant, including naval-themed artwork and many interior and exterior improvements. Mr. Chiles’ Chandlery is a picturesque waterside gift shop adjacent to the restaurant. Browse a fine selection of nautical and historically-themed items for terrific mementos and gifts reflective of the 19th century.